Lorain County Community College’s Stocker Arts Center will present The Midtown Men, four stars from the original Broadway cast of “Jersey Boys” at 7:30 p.m. on Sunday, November 18 in the Hoke Theatre. They took Broadway by storm in one of the biggest hits of all-time. 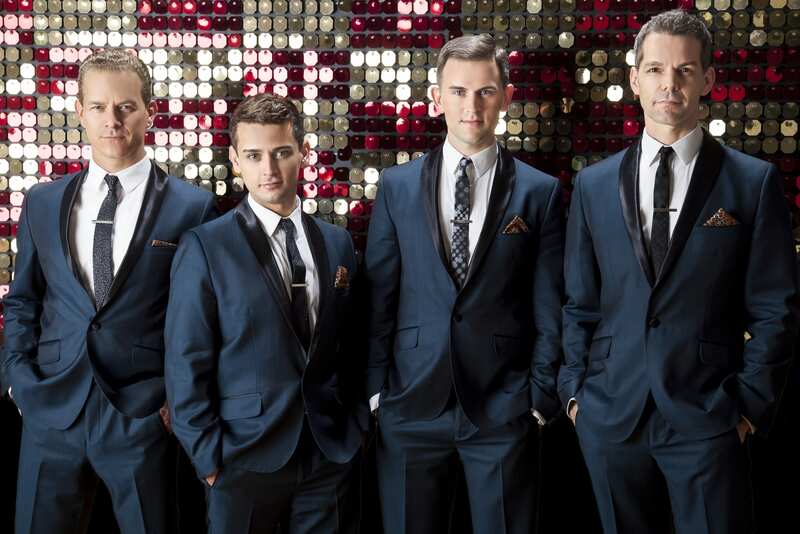 Now The Midtown Men are bringing their magic to Stocker Arts Center, singing their favorite ’60s hits from The Beatles, The Rascals, The Turtles, Motown, The Four Seasons and more. The show reunites Tony Award-winner Christian Hoff, Michael Longoria, Daniel Reichard (who is from Rocky River originally) and Tony Award nominee J. Robert Spencer in this one-of-a-kind concert experience. These talented entertainers shared the Broadway stage for over 1,000 performances in “Jersey Boys.” The Midtown Men have thrilled crowds on concert stages across the US, Canada Beijing, Venice and beyond. They’ve delighted television audiences on “The Today Show,” “Good Morning America,” Access Hollywood,” “Katie,” and “The Chew.” The group has also released two successful public television concert specials: The Midtown Men Live in Concert, and Meet the Midtown Men, which goes behind the songs to get an inside, personal look at the Men and their music. Stocker Arts Center offers dinner prior to the Performing Artists Series shows. The Midtown Men dinner will be held in the Norton Culinary Arts Center next to Stocker Arts Center and seatings are at 5:45 p.m. or 6:15 p.m. Tickets for dinner are $30 per person. Valet parking is also available for this show for $5 per car and can be purchased in advance or paid in cash on the night of the show. The Performing Artist Series single tickets are $40 for orchestra and $33 for mezzanine seats. Tickets are $10 for active duty military members, as well as youth 18 and under and students with valid IDs. Subscriptions are also available for 3, 4, or all 5 of the remaining shows in the series for this season. To purchase tickets for any of the shows or to request a season calendar, call the box office at (440) 366-4040. Hours are Monday through Friday from noon to 6 p.m. The box office is also open 90 minutes before ticketed events (60 minutes before Student Matinees). Tickets may also be purchased online at http://www.StockerArtsCenter.com. Stocker Arts Center is located on the campus of Lorain County Community College at 1005 North Abbe Road, Elyria, Ohio. Parking on the campus is free unless you choose valet parking.